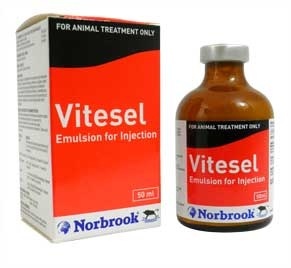 Vitesel Emulsion is given by injection to farm animals to prevent and treat deficiencies of vitamin E or selenium. In particular it id given to prevent White Muscle Disease. It can be given to piglets, calves and lambs with no withdrawal period. If given to ewes there is a 28 day meat withdrawal period. Treating pregnant ewes can help to prevent the disease appearing in lambs (their milk should not be used for human consumption). Below are some recent questions we've received regarding Vitesel Emulsion for Injection, including answers from our team. The injection can be repeated again after 2-4 weeks if required though you should discuss this with your vet.